Speaking of codes, I obtained the colour codes via Inkscape (the program I used to do my vectors) by pressing the button to take a screenshot (in Linux, a prompt soon follows asking where to save the screenshot you just did) and pasting it into the the program. This can get tricky: the bottom part (percentage varies) may become corrupted and appears to be random. Do note that the screenshot might be saved as "pastedpic_***.png" at the folder of where you last saved a file with this program (If unsure, check the properties.). To overcome this, paste the image in Paint first and save it as a PNG (or BMP) file and import it. Since the area of the colour you want to choose, especially text, you might want to use the browser's zoom feature to the area in question before taking the screenshot. Although the newer version might appear identical to the previous version, the code used has been changed. The old code contain stuff like "tr" or "wbr" that I don't really understand. Also, the old table code might appear inwards on Gecko-based browsers (eg. 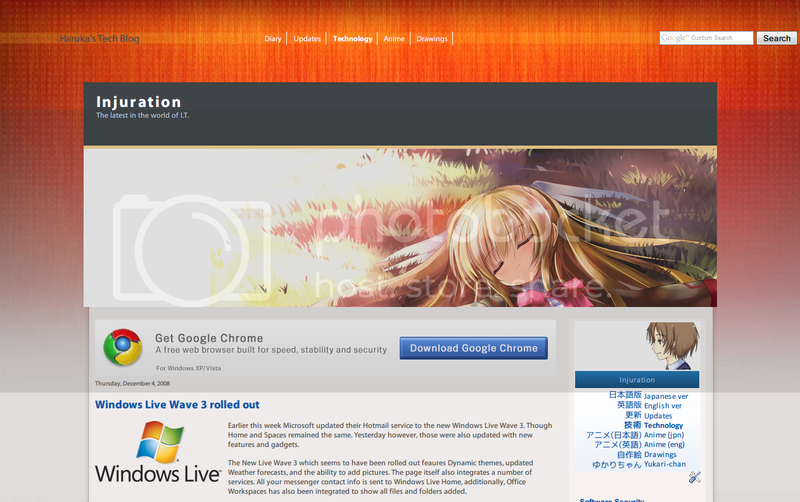 Firefox), but appear normal on other browsers. There also was this mysterious gap between two images. With code learn from the current versions of my story and the navigation menus, I decided to apply it here too. Using the trial-and-error method at the testing blog (to try something new and in the case something goes wrong), I managed to put this up. Changing font colour codes: "white" and "black" became "#fff" and "#000" respectively. Used stylesheet for the thumbnails as a background instead of as an image source. The first column below the header of each set of tables are now merged and the text aligned to the right. Table-within-a-table was used to create listing itself. Since the image URLs are move to somewhere else, the codes are easier to work on. Removal of "Current (...)" and "Upcomming (...)" and kept the words in prephansis. Header text is now aligned to the left. Images for Umineko, Yoku, and Kobato are added. 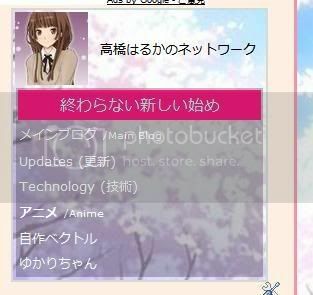 "Ep" is replaced by "Currently at episode" and "Date" is replaced by "Commencing on"
Although not related, but happened shortly before the change, I had updated the dates of the anime and rearrange them by date. 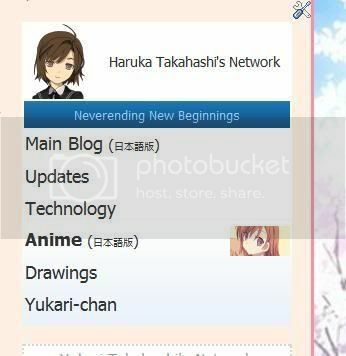 Haruhi and Hayate had swapped places as the former airs earlier. Well, my navigation menu you see on the top of the right widget bar is starting to get messier and uglier that I have decided to do a brand new one from scratch. Actually, it got ugly and bulkier from the last update. Not only in appearance, but also the code involved. 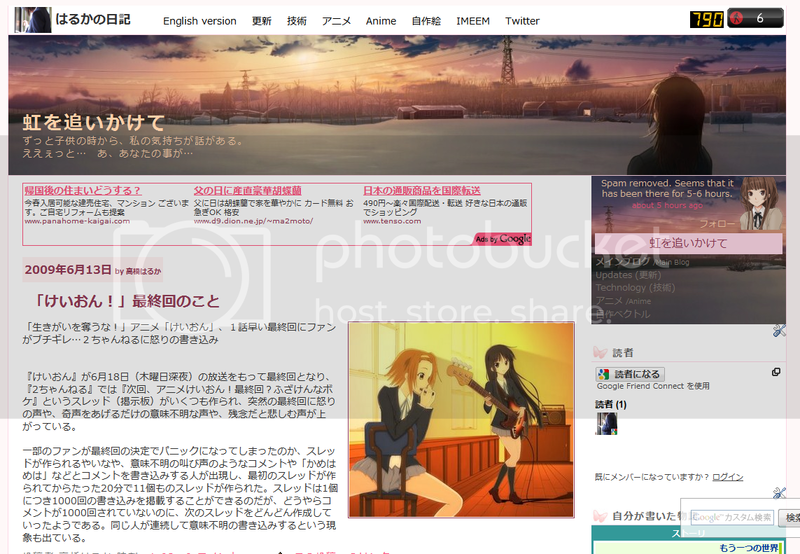 They are originally supposed to all look the same, with only the title and type of blog changed. 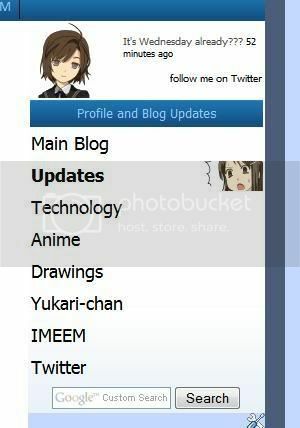 The navigation menu featured here is what it looked like when I first made it. Clean and simple. 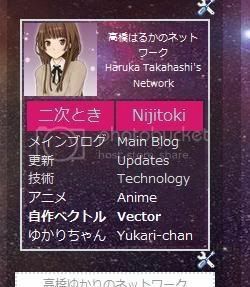 That empty space there was intentional, but I added random quotes or "Haruka Takahashi's Network". For ones that had the former, it was latter replaced with my latest post from Twitter. Also, hovering over a link there would have a background, but as I found out later on, this also affected other links on the blog. That problem wasn't really fixed until just last month. Shortly after doing v0030a, I replaced the image and have it aligned to the left. 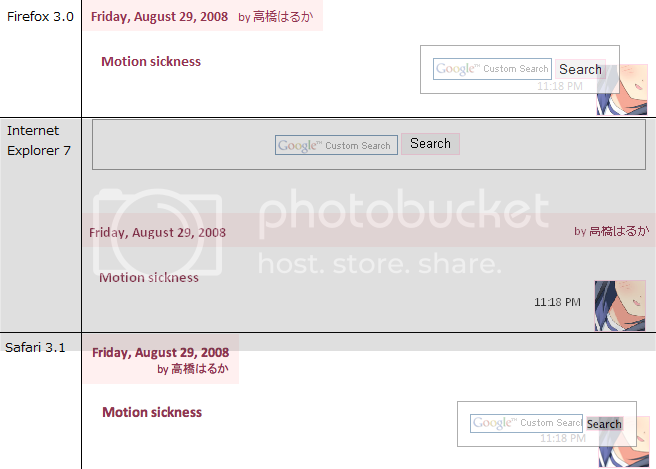 I have also made the links larger and if you hover the row where a particular link is, an image would appear. These are 60*60 images that are (at that time) also used for displaying my drawings on my non-main blogs, which itself, has now changed to 80*80 versions. In the case of the links to the Main and Technology blogs, new ones were used. 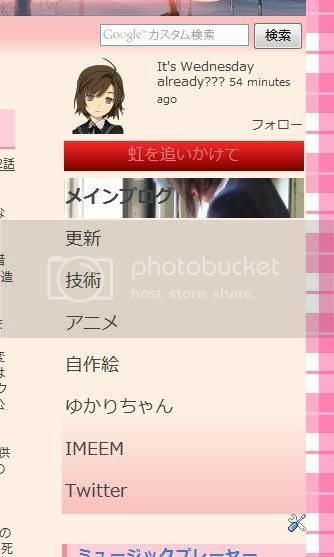 If the blog does not already have a search box, I would add it as part of the menu. The pink/red colours were originally part of an experiment to try different colours of the navigation menu, but didn't really work out well, especially with the strong red for the title. 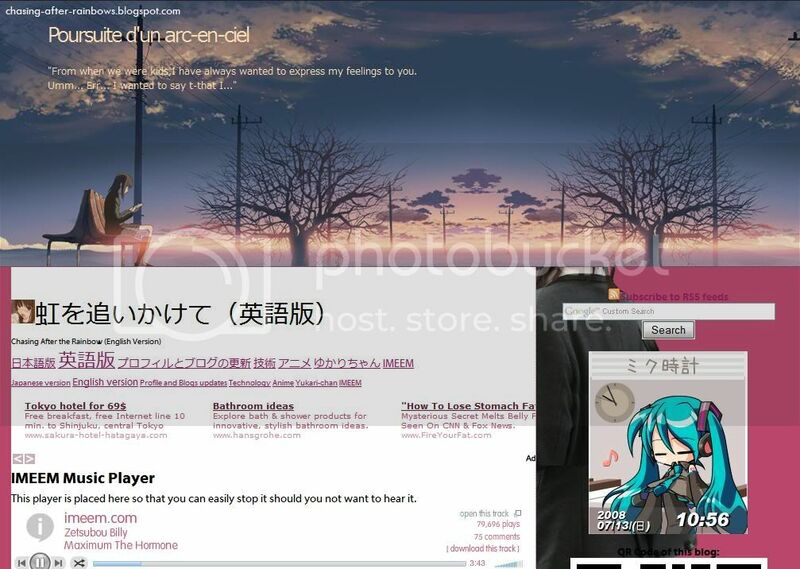 Since both blogs uses mostly pink/red and matches more than the blue version, I have left it untouched. Also, I found the images to be quite small and decided to have it occupy the entire row. At first, it was to have the image to gradually fade from transparent to opaque from left to right and have it aligned on the far right, but it looked horrible and editing the images to get it was too troublesome. So I gave up and have it to occupy it completely. 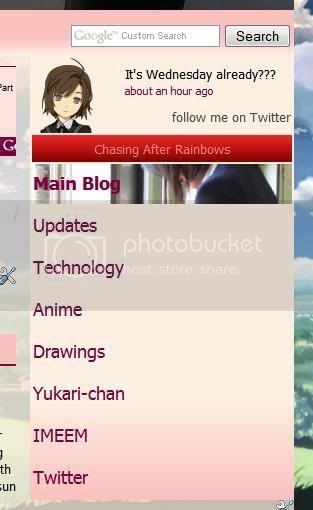 Since the blog layout that has this menu the widest is the drawings blog (back then) at 280px, I used that as reference for the maximum width. 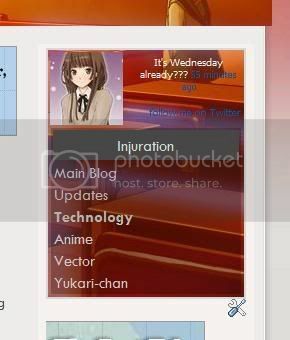 Not too long ago, Yukari changed her navigation menu and me changing my Twitter page (on the same day as I found images of both the avatar and background). Though simple, it actually looked nice. So in order to improve mine, I have to dump all the image codes except the avatar. 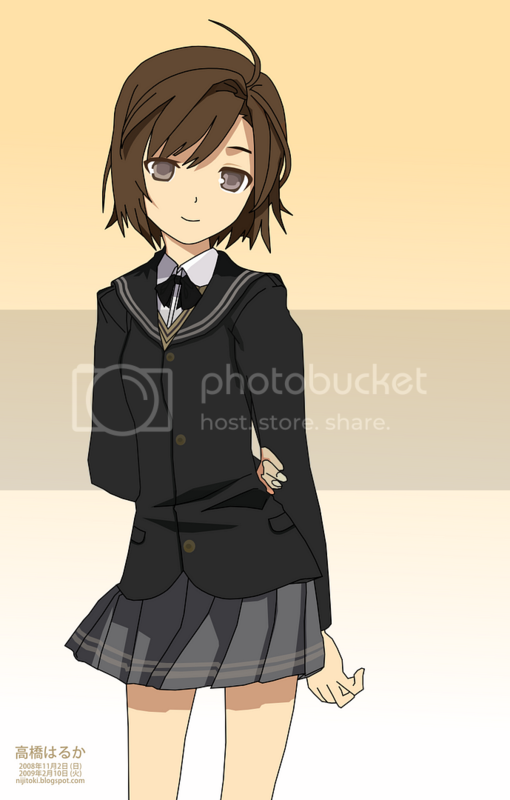 The avatar is the exact same image used at Twitter, so the area for my avatar has been reduced from 80*80 to 72*72. Originally, they are supposed to have just a white background, but I use the same background as the blog background or any other image that are already used on the blog. This not only makes it looks nicer, but also save bandwidth from loading the images. Since having an image to appear when hovering over a link is removed, even more bandwidth is saved. That black semi-transparent background is actually recycled from the old drawings blog and helps reading against the textured image easier. 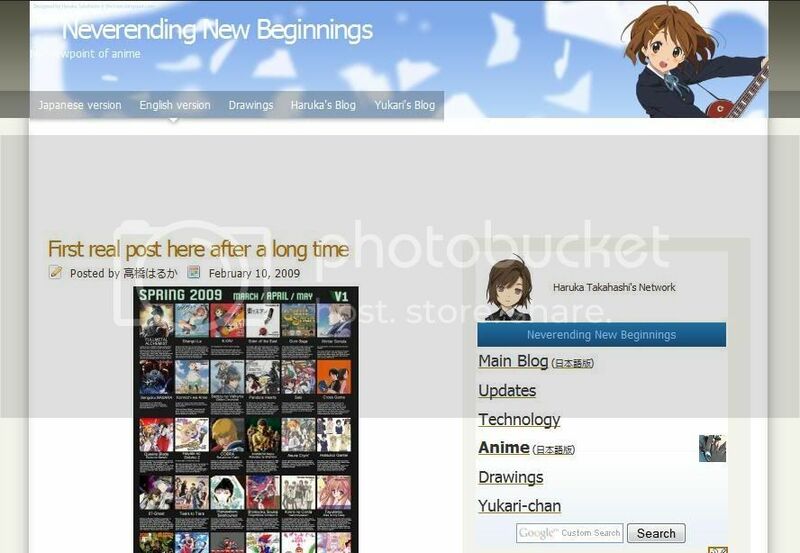 Except for the Anime blog in English, I'm not sure if I want to apply the new version to blogs that are still using the older version for legacy reasons or would actually match the blog layout the most. 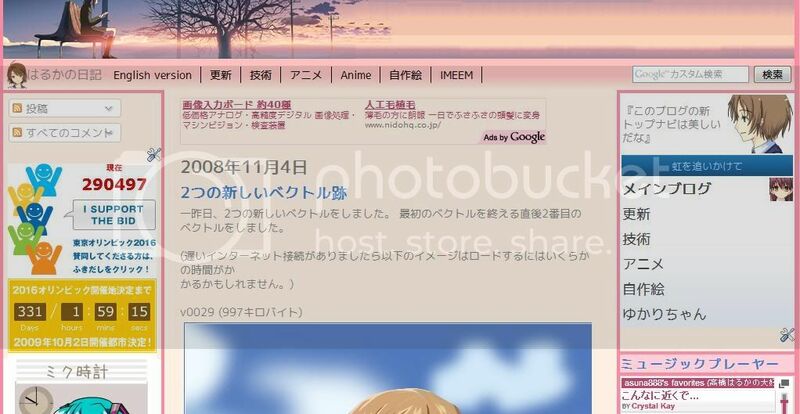 Currently, the diagonal length of the menu on the Japanese main blog is 5 inches, but the drawings blog is 3 inches. That is quite a lot. I might also replace the avatar of the new navigation menu with an identical-looking v0080 when I'm done with it.